I recently finished up with my college classes for this semester, so I dove back into GTA Online. R* was running a 25% discount on the “Cunning Stunts: Special Vehicle Circuit” DLC cars; I bought the Grotti Turismo Classic when it was released, so I grabbed the other three cars. I usually test cars out by running them on three laps of the “Loop the Lake” race. The stock Progen GP1 has pretty good acceleration, and I usually get a total time of 2:45-2:47, making it a solidly mid-tier Supercar in my experience. I like the GP1's looks, as well as how customizable it is. 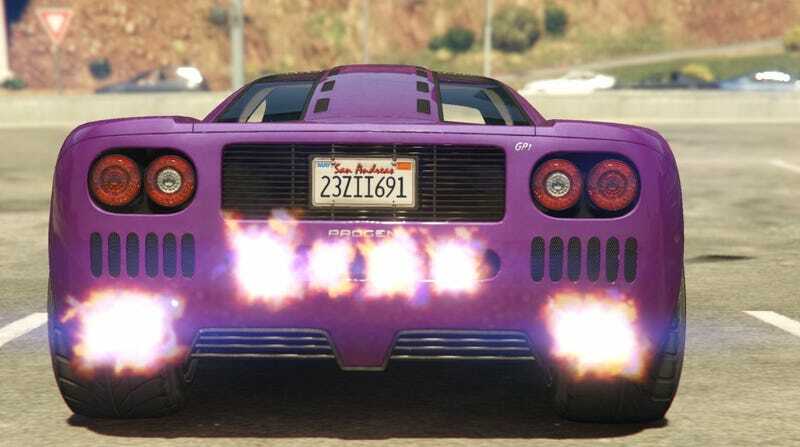 The stock Pegassi Infernus Classic completes 3 laps of the track in ~2:55 (in rental form without the spoiler), making it the second-fastest Sports Classic car. I like the look of it, too; it’s basically a Lamborghini Diablo. Pegassi Infernus Classic; engine view. Pegassi Infernus Classic; side view. The Pegassi Infernus Classic’s interior. Pegassi Infernus Classic; the seats. The Grotti Turismo Classic is basically a F40/Testarossa mix, and it looks great! It’s performance when stock is nuts, too; in rental guise (which isn’t equipped with a spoiler), it gets a time of ~2:52 in 3 laps of “Loop the Lake.” That’s extremely competitive with the best Sports cars that I’ve run on that track. The one that you can buy (which comes with a stock spoiler) clocks a total time of about 2:46-2:47, making it competitive with mid-tier Supercars stock-for-stock. I love this thing; it’s my favorite car released so far this year, with the Imponte Duke O’Death ranking a close second. The Grotti Turismo Classic’s interior. Grotti Turismo Classic; side view. Grotti Turismo Classic; opened up. Grotti Turismo Classic; engine view. Grotti Turismo Classic; rear view. I also bought the Hijak Ruston; I can get a 3-lap time of ~2:53 in stock form, so it seems to be a pretty good Sports car on tight tracks. It gets unsettled by imperfections in the road, though not as easily as the BF Raptor.